Today is Sunday, so I decided to have a quiet day of reading and writing. I do want to get some writing done while I'm here! I drank coffee, and made myself a sandwich of baguette, meat, chevre cheese and hard-boiled egg, and ate it with green olives and some of the lovely orange melon I bought at the market yesterday. I wrote... I did another load of laundry... I watered the flowers in Madame's window boxes. She has beautiful blooming geraniums in all her windows, except one (where the pigeons apparently do their business above, and she's given up). By the time evening came round, I was ready to stretch my legs a bit. And I suddenly remembered that I'd seen a sign, when I toured the beautiful Sainte-Chapelle Chapel on Ile de la Cite, announcing some sort of Sunday concert series. Thanks to the wonders of the internet, including churches with websites and Google Translate, I was able to figure out the details. There was, indeed, a concert tonight, and it started at 7pm! I threw on a dress and a scarf, and headed down there. Apostle, keeping an eye on things. The Rose Window. For the concert, we entered through the big red doors beneath -- the way the king would have. The angels in the details. Folding chairs had been set up in the chapel. 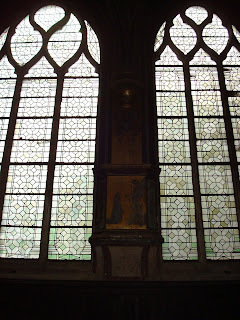 Beautiful golden light was streaming through the astoundingly tall stained glass windows. 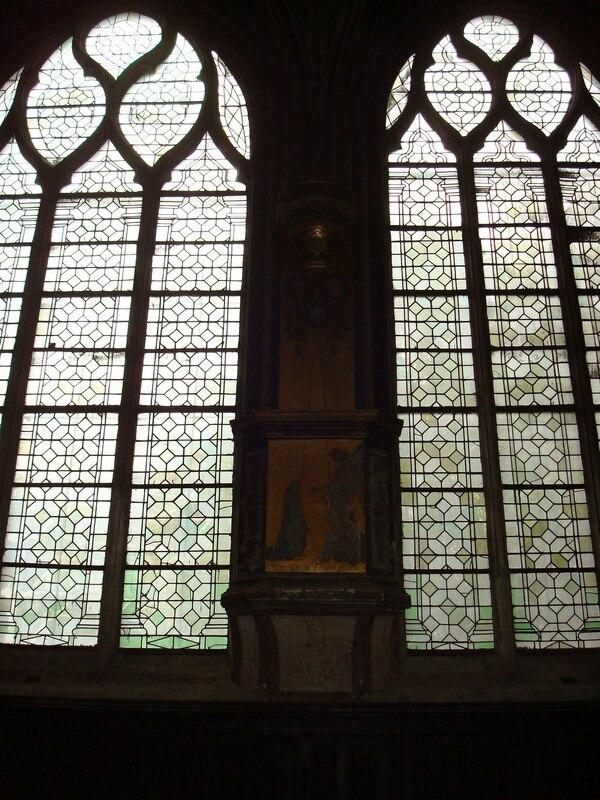 The chapel was consecrated in 1248 (can you believe it? 1248) to house King Louis the IX's collection of relics. 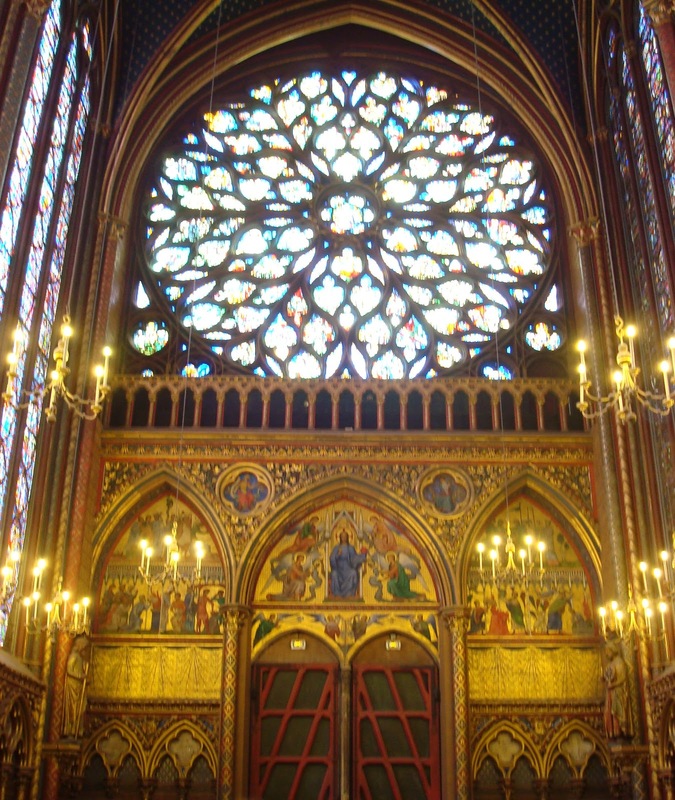 Each window illustrates stories from the Old and New Testaments of the Bible, as well as the discovery of the relics and how Louis transported them to France. Blues and reds dominate, but there's yellow and green and brown and clear glass as well. 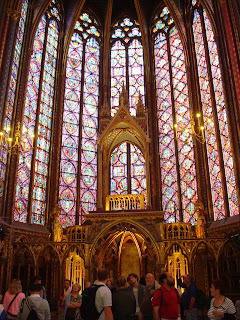 The Rose Window in the back, on the western side of the chapel, was lit up like a starburst. The long narrow pillars between the windows are painted in muted blues and reds, and decorated with little golden castles and ivy and fleur de lis. Statues of the twelve apostles gaze down at the people congregated below. The program for the evening was, appropriately, "Masterpieces of Sacred Music." 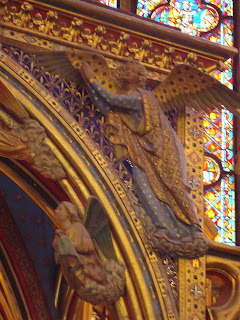 The Paris Classik ensemble is in residence at the Sainte-Chapelle, and gives more than a hundred concerts a year there. The string quartet was joined by mezzo Ghislaine Roux -- who looked very much like Mercedes Ruhl, and sang like an angel. Tonight's songs were "Ave Maria & Agnus Dei" by Schubert, Bach, Gounod, Mozart, Bizet and others. 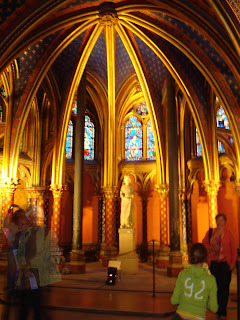 The string quartet and single singer were the perfect size group for the chapel, which is tall, but not terrible large. They filled the place with music. It was a gorgeous way to spend an evening. 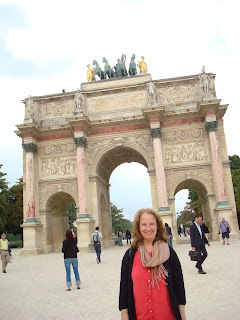 A short post this evening, because it has been another full day of revelry, tourism and good food here in Paris! And I just was able to finish loading the pictures from yesterday into yesterday's post, after a few technical difficulties. Today, after a little housekeeping here at the flat, I had a tour of the Latin Quarter with a Paris Greeter by the name of Mehmet. 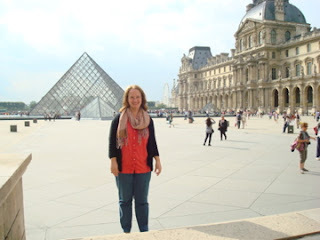 I read about the Paris Greeter program when I was doing research for my trip, and it sounded wonderful. 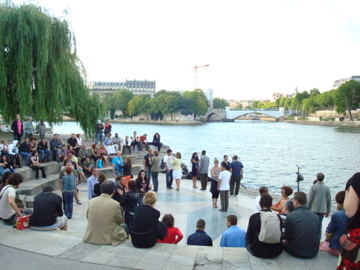 It is entirely staffed with volunteers, and its purpose is to allow Parisians to share a little part of the city (and their love for it) with people who come here to visit. It is more "someone showing you around their neighborhood" than it is a formal tour. Which sounded great to me! You sign up on their website, and let them know (preferably at least two weeks in advance) which days you might like to take a tour, which language you'd like the tour given in, and if you have any special needs (like perhaps someone in the group who doesn't do well with a lot of stairs). They pair you up with a greeter, who e-mails you, offers a tour in a specific area at a specific date and time, and asks if you would like to take that walk. 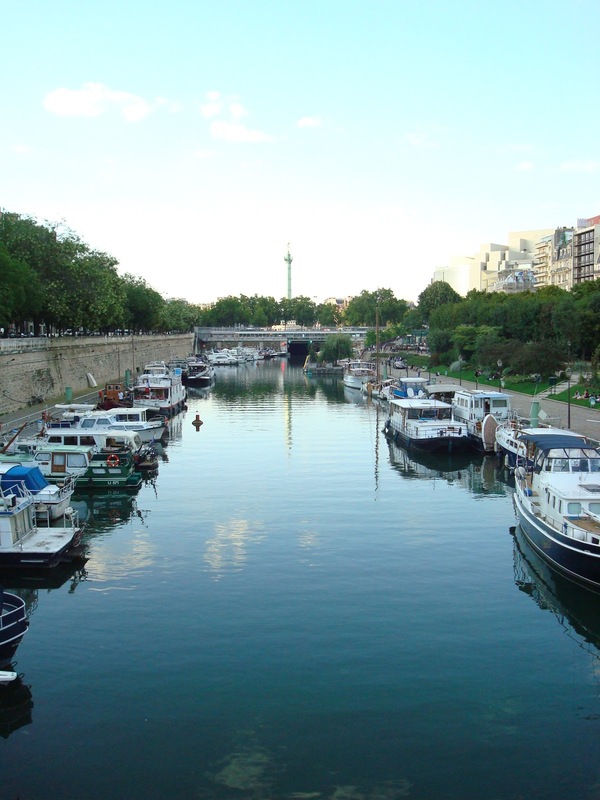 I received an e-mail from Mehmet, who asked if I would like to tour the Latin Quarter -- historically the student section of the city, just north of the "iles." I said that sounded fantastic! 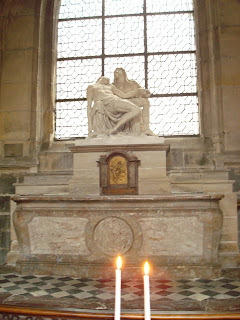 We agreed to meet late this afternoon at Saint Sulplice Metro Station. I got a little bit turned around, and was a few minutes late, but thankfully Mehmet waited for me. 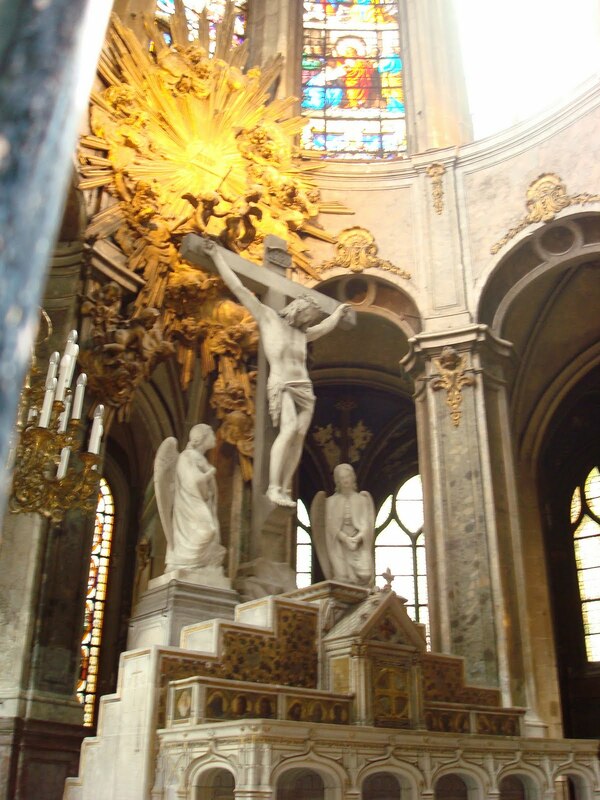 Then he proceeded to take me on a lovely tour of the Latin Quarter -- during which we had a lovely conversation. I think that's the best thing about the program. I can look up facts in my guidebook -- but having a chat with someone who lives in the city and love the city is something else entirely! 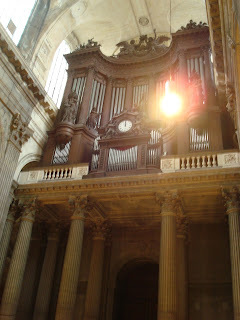 As we visited Saint Sulplice and Saint Germaine churches, strolled past the Sorbonne and other major universities, spotted Les Deux Maggots (famous hangout of Sartre and Beauvoir and Hemingway), and stopped by the Pantheon, we chatted about everything from philosophy and religion to education and the cool time-telling gizmo in St. Germaine. 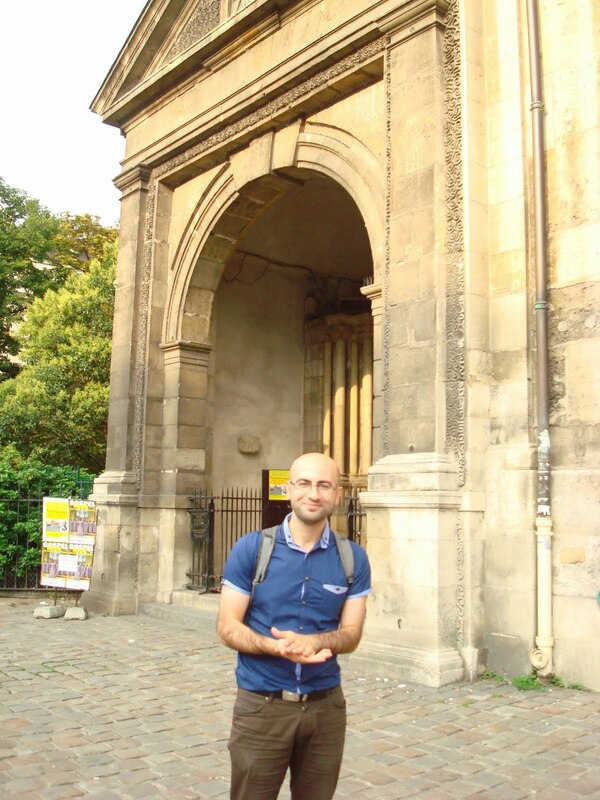 Mehmet was born in Turkey, but has lived in Paris for more than twenty years. He's an engineer, who works for a local engineering firm. He is fairly new to being a greeter, and said that he started doing it because he's traveled to several other cities, and really appreciated having guides. So he thought he might try it! 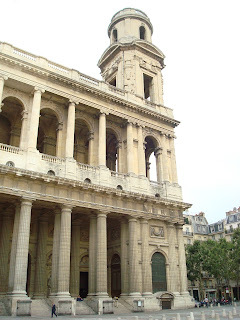 Saint Sulpice -- the second largest church in the city, after Notre Dame. Home to a fantastic organ, designed by multiple architects in a variety of designs, referenced in the Da Vinci Code (with errors) and containing a gnomon, a line on the floor which the sun hits from through a certain window, marking the longest and shortest days of the year. The gnomon. Taking this picture, the window through which the light comes is behind me. You can see that the line runs all the way up the far wall. It was completed in 1743, and is a really impressive sundial doohickey. 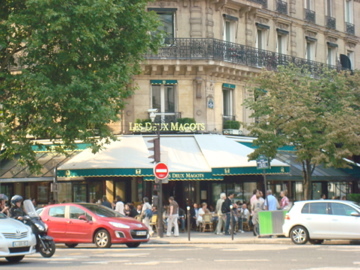 Les Deux Magots. Must go back and have a drink there. 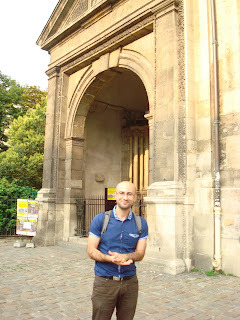 My Paris Greeter guide, Mehmet, in front of Saint Germaine church. A little street in the Latin Quarter. 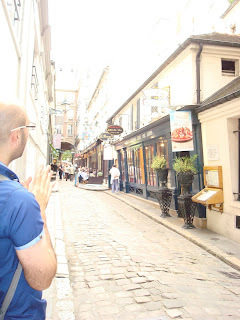 That is the oldest restaurant in Paris! Ellen at the Pantheon! 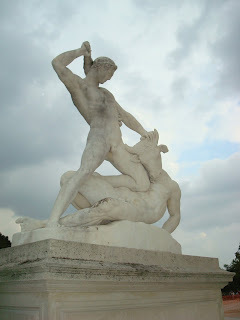 "Aux grands hommes la patrie reconnaissante." (To the great men, the grateful homeland.) 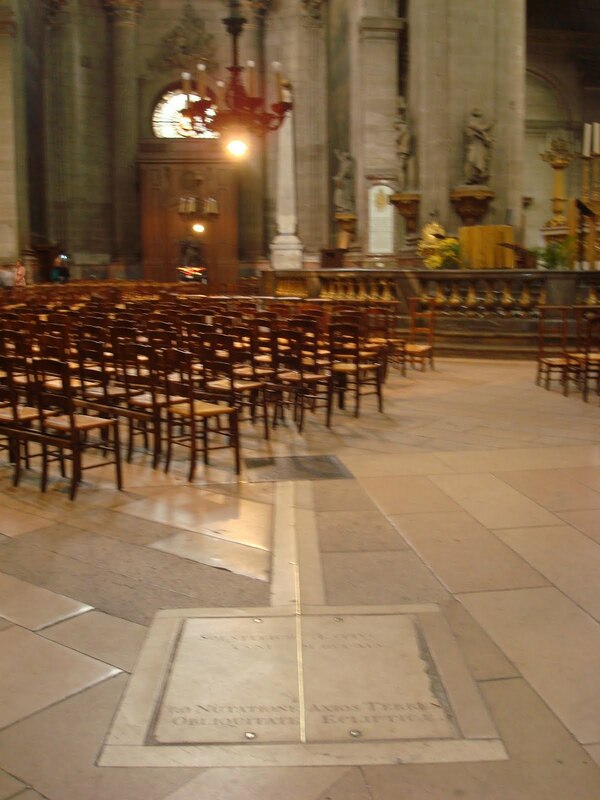 Great men (and a few women) of France are interred here. Must come back and see inside (and upstairs!). After my tour, I met Eliza for dinner and more conversation. She goes to Princeton, but is here doing research for her dissertation on things medieval and french. It was lovely to see a familiar face! We had a very nice talk, catching up a bit over a wonderful dinner of crepes and cider. 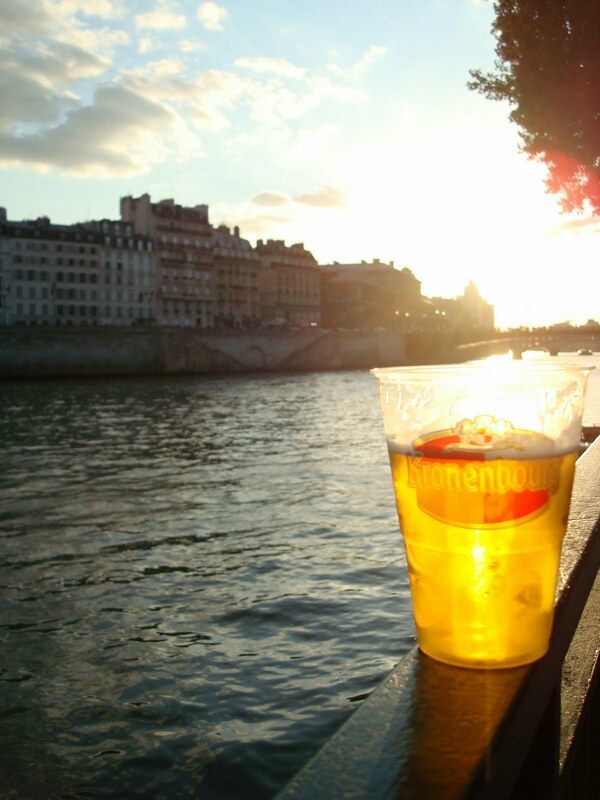 (Apparently cider -- hard and slightly dry -- is just the thing to have with your crepes). I started with a crepe filled with blue cheese, bacon, creme freshe and lardons, and then we both had dessert crepes with caramel sauce, almonds and vanilla ice cream. Oh, the decadence!! Eliza, with fantastic dessert crepes! French sweets. The shop smelled like some sort of chocolate heaven. I am sitting in a cafe in Paris, drinking a glass of red wine and writing. There's another checkmark on my life's to-do list. I'm back on Rue Saint Martin, at the Grizzli Cafe. Its logo is two little bears. So I decided, when I finally woke up, that I would just use the cash machine and take a walk. Using the cash machine was something I had to gear myself up for. And then how much trouble could I get into on a walk? One good reason to travel is that it makes you think about things -- be aware -- in a way we often aren't in our daily lives. Like using the cash machine. My haphazard research into France had told me that I could use my debit/credit card at ATMs (as long as I had my pin number), but likely not when I was out and about at stores and restaurants. In France, they use cards that have an extra "chip and pin" security system built in. I got cash from the ATM when I first arrived, at the airport, but couldn't buy a train ticket with my card -- that machine wouldn't take it. It is a little scary to put your card into a machine in a foreign country. (Uncle Harold told me he also felt some trepidation doing it, when he and Aunt Lori went to Calais a few years ago.) 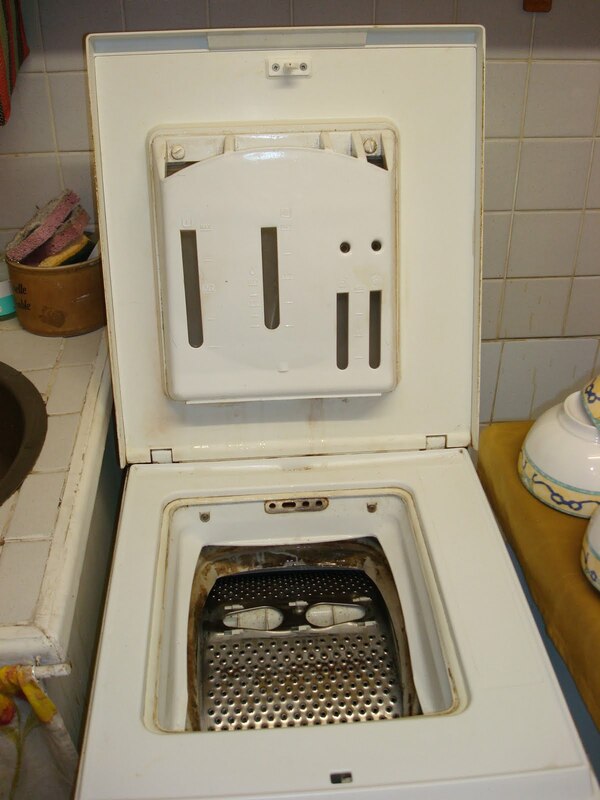 What if the machine doesn't spit it back out again? That's the worst thought. It could happen when I'm in New York, or anywhere -- but it's a scarier prospect when you don't speak the language and you're farther from home. What if the machine doesn't give you any money? 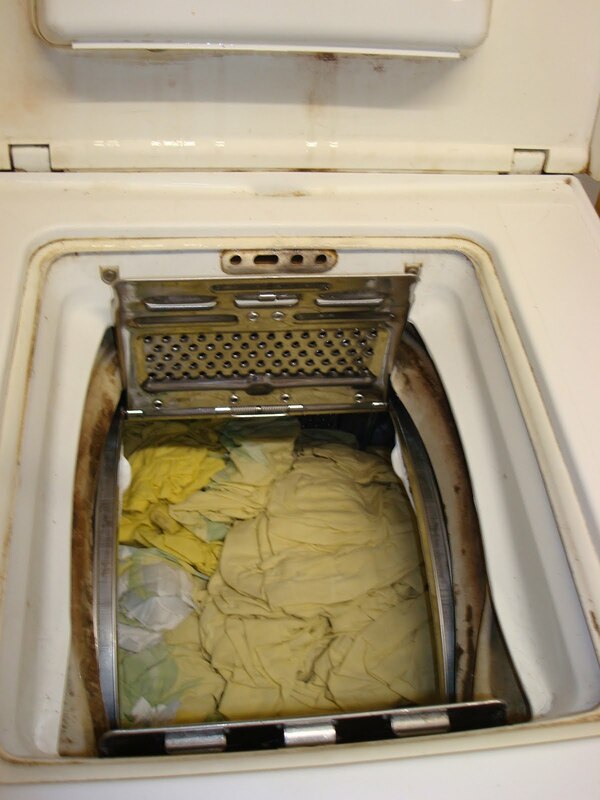 What if someone robs me while I'm trying to use the machine? 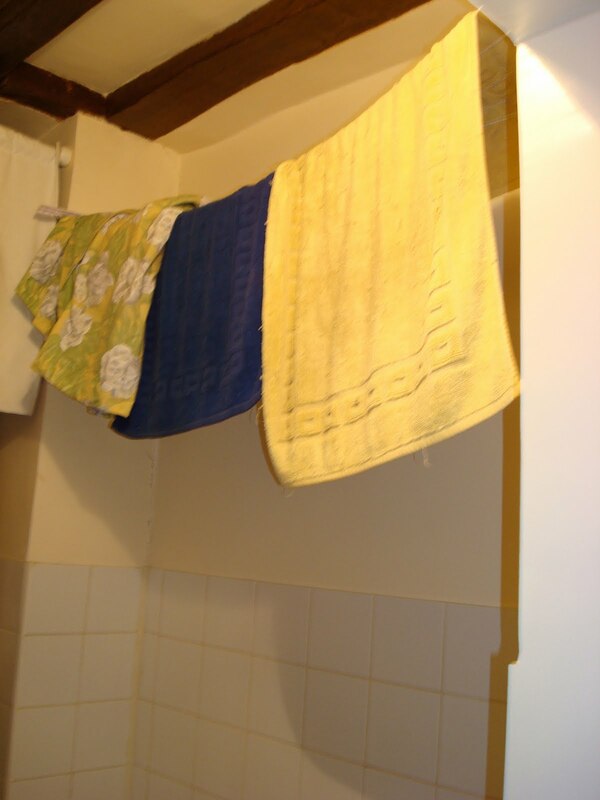 But after all of that build-up, it was fine, and easy. I now had a clutch of Euros in my pocket, and was ready for adventure. So! Now it is almost ten o'clock at night, and I have just finished a lovely glass of wine and a great meal, and am awaiting dessert. (It's a good think I used the money machine. This is a splendid splurge of a meal.) What have I been up to all afternoon? Well, I took my walk! Tony had suggested I might enjoy the Tuileries area, if I was looking for a nice place to walk. And that area was definitely on my list of places to go. 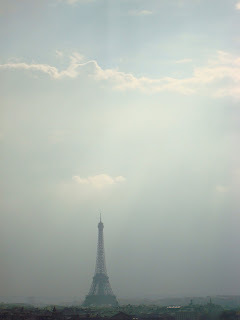 It's going toward the Eiffel Tower from where I'm staying, in a generally westerly direction. 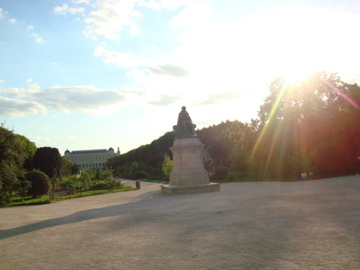 I saw on the map that if I went down Sebastopol a bit, then walked west on the Rue de Rivoli, I'd run right into the gardens. I could walk there a while, then come back along the river afterwards, in a nice long circle. I love to walk, and Paris is such a beautiful city to walk in! There are gardens everywhere, and places to sit, and fountains, and so many things to see. I watched Woody Allen's "Midnight in Paris" just before I left on my trip (because it was playing right there in Princeton, and how could I not?). 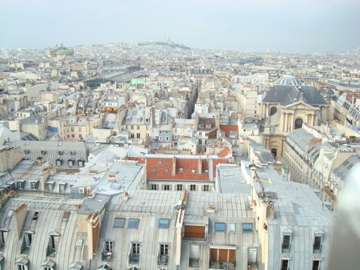 That movie surprised me by starting with an eight minute long (or so) photo montage of Paris. No people -- we hadn't met anyone yet. Just the city. For a long time. Beginning the film that way slowed us down, as viewers. Indicated that place was important in this story, and we were going to take our time exploring it. And then the rest of the film was a sweet little love letter to writers, past and present. Very fun. I've also been reading a book by Edmund White, a writer who lives and teaches in Princeton now, but lived in Paris for sixteen years. The book is called "The Flaneur" -- which is the French word for "that aimless stroller who loses himself in the crowd, who has no destination and goes wherever caprice or curiosity directs his or her steps." Mr. White is a grand raconteur, who can speak as easily about Colette's literary works as he can about Jean-Paul Sartre and Simone de Beauvoir's writing schedule, Josephine Baker's affair with Georges Simenon and where to buy a scarf. So I was a flaneur today, in the Tuileries gardens. 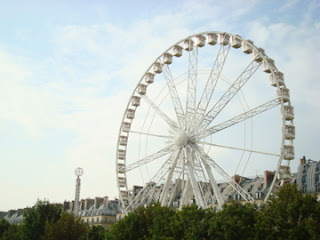 And I took a ride on a ferris wheel. 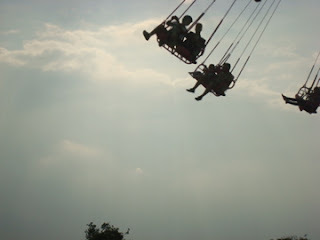 Because I'm one of those people who will never turn down a chance to ride on a ferris wheel. Here are a few pictures from my wander. Perrault's Colonnade -- the entryway to the Louvre complex and gardens. IM Pei's pyramid entrance to the Louvre in Cour Alexander. 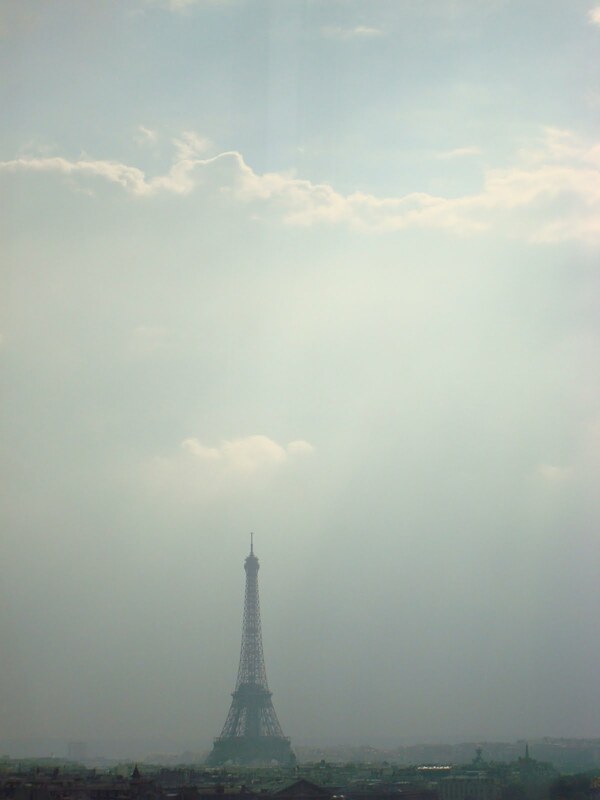 The Eiffel Tower and stormy, brilliant sky from the ferris wheel. The Tuileries, from the ferris wheel. Rooftops of the city from the ferris wheel. 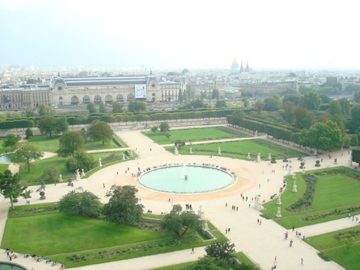 The whole Louvre complex and gardens from the ferris wheel. People on the next ride over, from the ferris wheel. Kids with push boats. There was a push boat minder, an older man who had a cart full of boats and sticks for handing out. 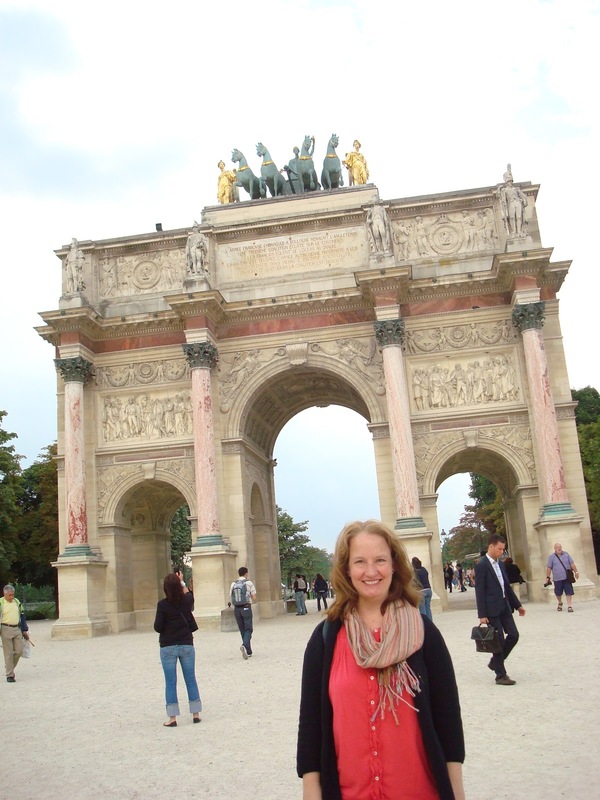 Ellen at the Arc de Triomphe! 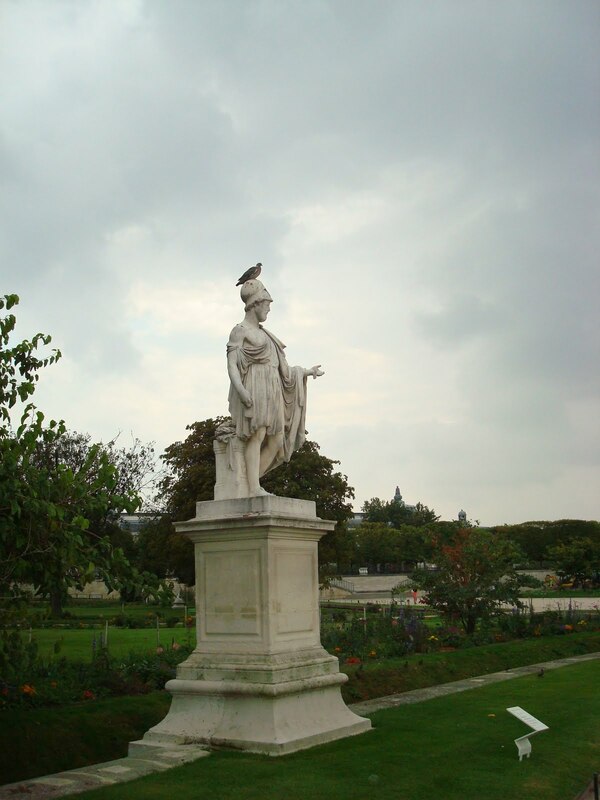 It's hard to look dignified when you have a pigeon on your head. 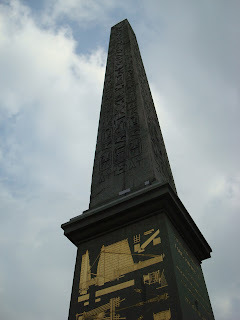 The Luxor Obelisk. It is 75 feet high, weighs more than 250 metric tons, is 3,300 years old, and once marked the entrance to the Luxor Temple in Egypt. It was given to France by the Khedive of Egypt, then transported there in 1833. The hieroglyphics that decorate its sides exalt Pharaoh Ramses II. The Grand Palais. Built for the Universal Exhibition of 1900 in the Beaux Arts style. 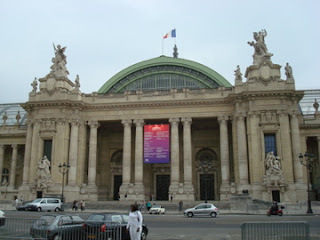 The Petit Palais. Built for the Universal Exhibition of 1900 in the Beaux Arts style. Across the street from the Grand Palais. 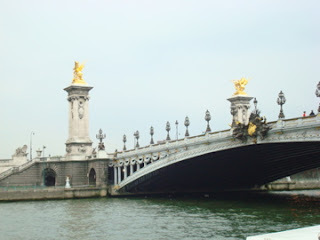 Pont Alexandre III. They have really, truly impressive bridges here. I thought Portland had nice bridges, but these are spectacular. 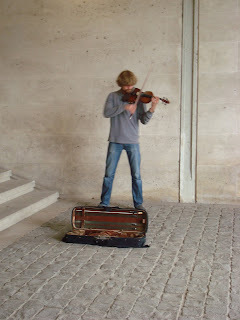 The violinist under the bridge. I could have listened to him for hours. I think he must have escaped from some wonderful symphony orchestra somewhere. A violinist on the lam. Walking back by the river. There were lots of people who had brought a bottle of wine and a picnic down to the water's edge, and were eating their dinner in the long hours between sunset and darkness. Public drinking doesn't seem to be discouraged here! 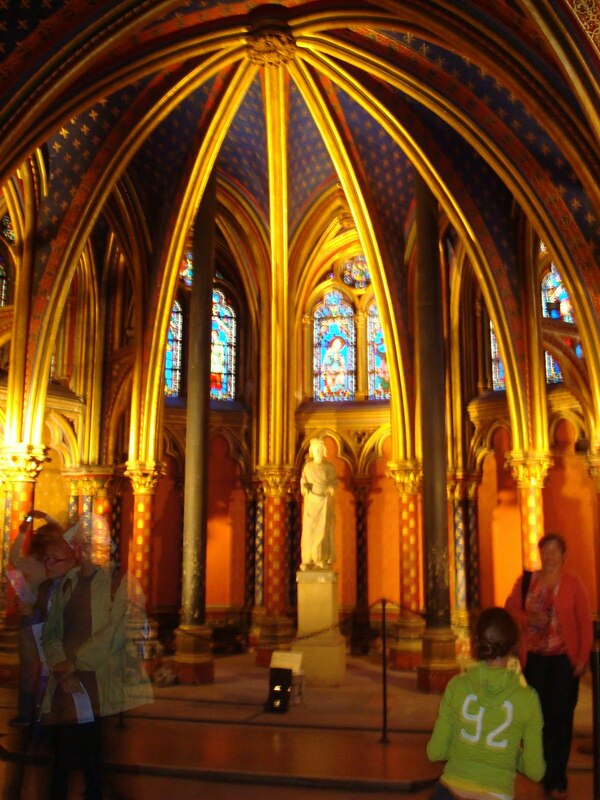 Paris, Day 3 -- The Door Was Open, So I Went In - Crypt Archeologique, Sainte Chapelle and Shakespeare & Co. I saw a man with a Campbells Soup can tatooed on his calf. Warhol devotee, or soup lover? What is art anyway? 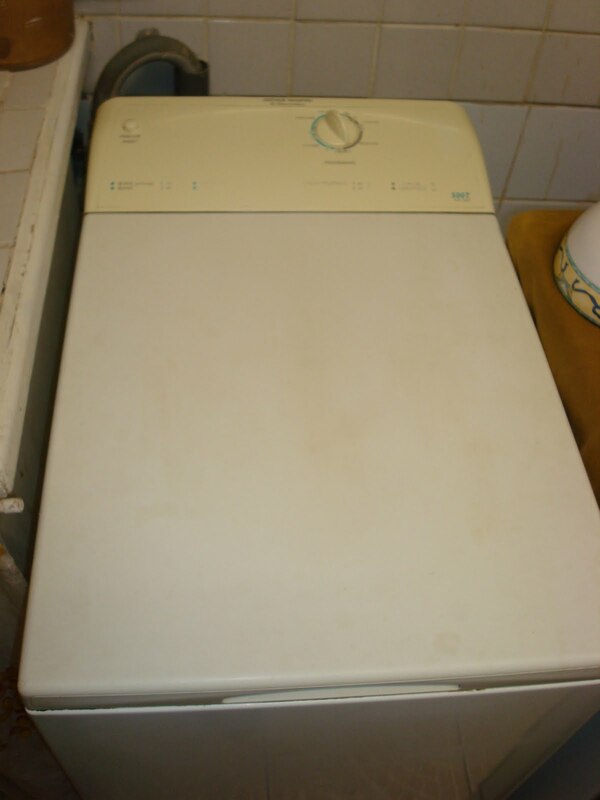 The friendly older blond woman who is often out on the street near the apartment building is a lady of the evening. But she works days. I guess if you've been at it long enough, you can set your own hours. Now it is afternoon. 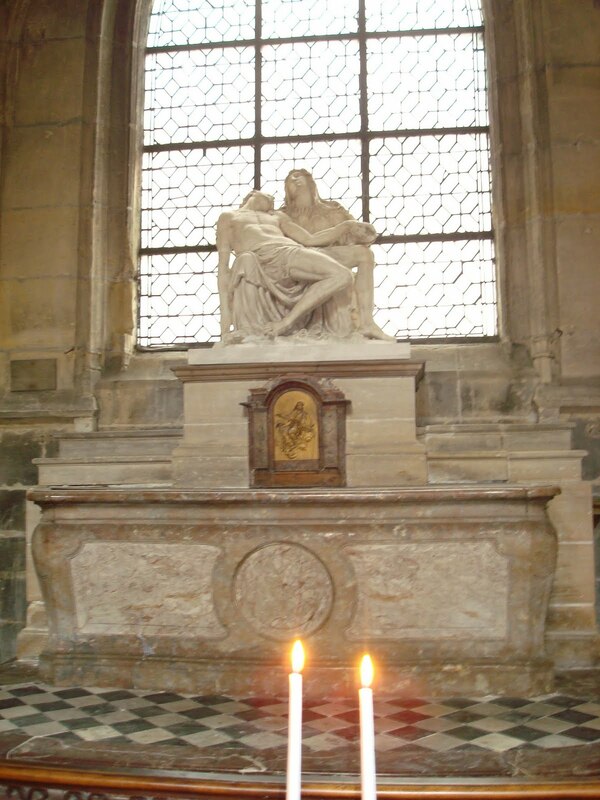 I have been in touch with E. -- a student of all things medieval and French at Princeton University -- who will be in the city for the next few weeks. 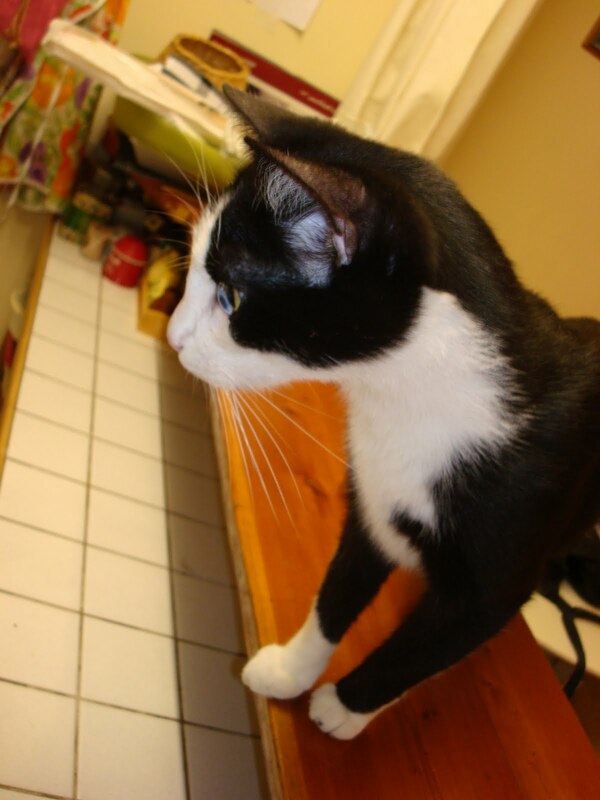 I am looking forward to meeting up with her when she has recovered from her travels. After the crepes came the crypts. Specifically, the Crypte Archeologique. 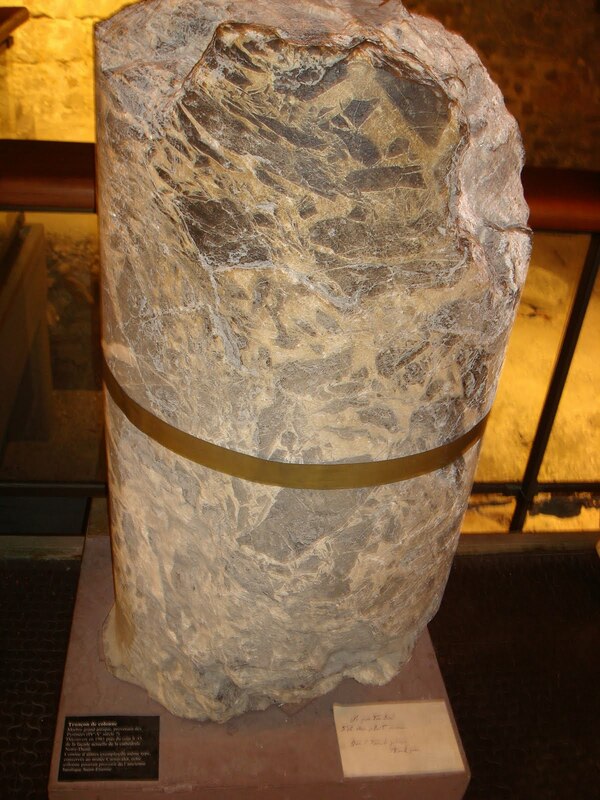 The crypt is a room full of stone, and it smells of damp earth and rock. 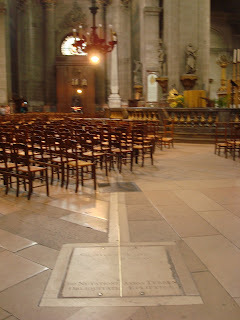 To reach it, you descend a set of stairs, cut into the square in front of Notre-Dame. You can see the foundations of the city -- as one city was built on top of another, and on top of another, over thousands of years. My two favorite things about the crypt: a little Roman soldier, and a hand-written "Do not touch" sign on an excavated pillar. 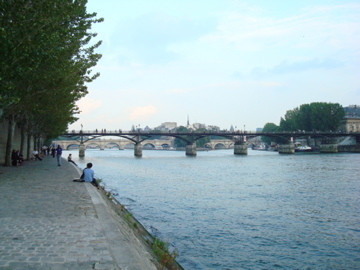 After the crypt, I needed coffee, and decided to have it on the other side of the bridge -- my first visit to the Left Bank. And what do I immediately stumble into but the celebrated Shakespeare and Company bookstore! I felt an electric shiver run through me, a flush of joy and recognition. I went to a little cafe across the street for my coffee before venturing into the bookstore. I sat outside and wrote... and watched tourists surge down the sidewalk in waves from their tour busses, Notre-Dame across the way, a nice French couple beside me (though we had too "apu" (little) of a common language to really converse), and the very pretty Parc Lagrange in front of me. All right. Coffee finished. Now: books! 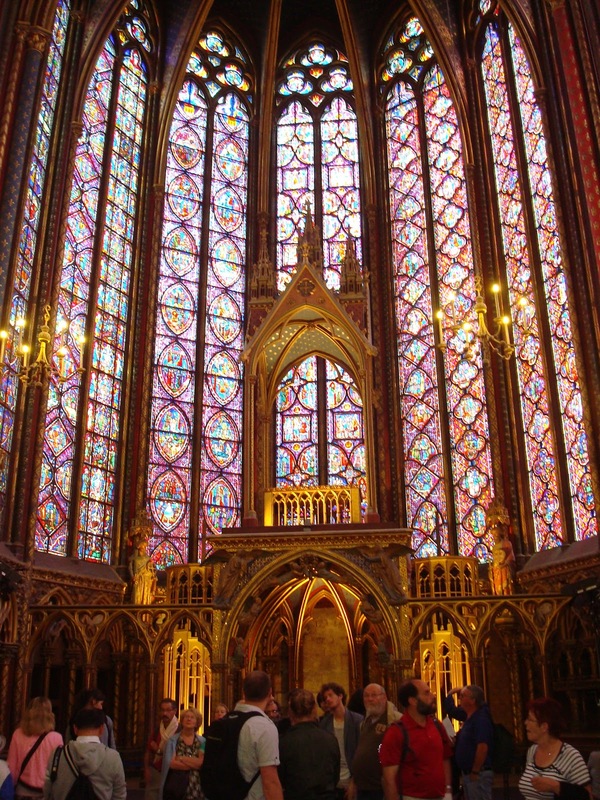 Could Saint Chapelle possibly be as beautiful a sight? I have had many adventures, planned and unplanned, and am now sitting in a little restaurant around the corner from the apartment, eating a nice big bowl of Pho soup -- which is just as warm and comforting on a rainy French evening as it is on a rainy American one -- or on a Vietnamese one, where it comes from, I imagine. Shakespeare and Company was everything I love in a bookstore. Packed with books, floor to ceiling, but relatively well-organized. Unapologetically keen on certain authors. Small shrines to favorite writers tucked into odd corners. Places to sit and read. Narrow passages that require careful navigation between browsers and make turning each corner a happy surprise. Theres a piano upstairs, kind of tucked into a bookcase, and a young Japanese man sat down to play a bit (and was fantastic). There's a typewriter up there, too, and little signs encourage anyone who feels inspired to sit down and write. I browsed happily for a bit, then walked out into the rainy afternoon. 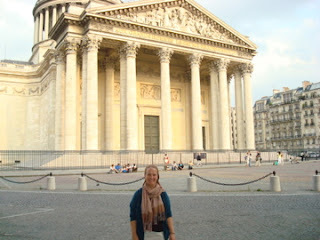 (If you've seen "Midnight in Paris," be assured that I'm the sort of girl who likes to walk in the rain. 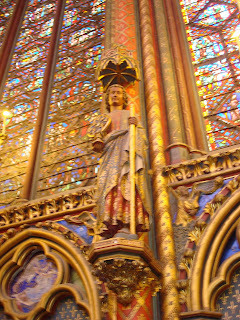 I am an Oregonian, after all...) I meandered through the flower market, since it was on the way, then queued up for Sainte-Chapelle. Paris apparently makes me chatty, because I was soon enjoying a lovely conversation with the two young Korean women behind me -- coworkers and friends who are spending a week here in Paris together. 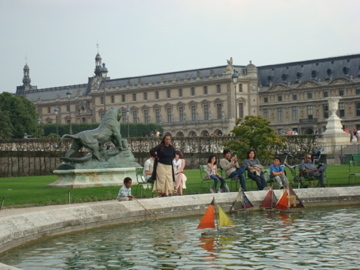 Pretty soon the nice couple behind them was taking our picture together, and telling us about their daughter who is living in London, and inspired them to take this tour of Paris, London, Germany and Luxembourg. They hailed from Illinois, about an hour south of Chicago. It didn't take long for the five of us to get through security and the ticket line, and make our way inside. The upstairs chapel. Walls of glass and light. The crown of thorns into the decorative carving/painting. The relic itself was kept beneath for a long time, before being moved to the Treasury in Notre-Dame. After a good look-about, I said goodbye to my Korean friends and headed back toward the apartment. Little did I know that two more sights would fling themselves into my view before I made it to dinner and home again! At the moment, there's an art exhibition going on there that combines new and old, technology and art and religious belief, into a fantastic amalgam. Set around the edges of the main platform are multiple large movie screens. On each of them, a pilgrimage is playing. Artist Gabriel Diaz calls his exhibit "The Ways of Saint James." Over the course of six years, Diaz journeyed on foot along 5,000 kilometers of the main Jacobean routes in Europe, that were used for centuries to cross the continent. He took a photograph every eleven steps. 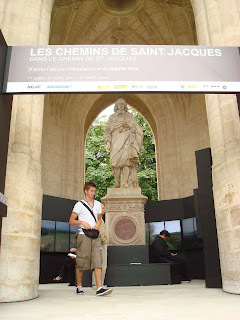 The images were then transformed into the videos that are playing on each screen -- each showing a different route. His very own pilgrimages! Which sometimes move through land that probably looks very much the same as it did hundreds of years ago. And sometimes he passes a Winnebago. They are really mesmerizing to watch. If I hadn't been hungry, I would have stayed and watched longer. But I was hungry. So I moved on. I was taking Rue Saint Martin again, which runs parallel to Sebastopol. 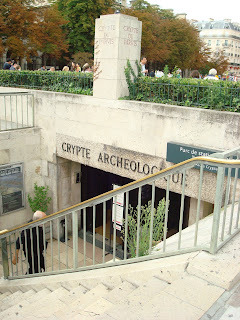 It has all the little shops and restaurants, which are lovely, but I'd also read about it at the Crypt Archeological. Rue Saint Martin was an old Roman road, which was being used back when the foundations in the crypt were holding up Roman houses and baths. No wonder it's so cool! I passed by yet another church... which I had before, but now the doors were open. So I went into this one, too! And found the strange, wonderful, eclectically decorated Church of Saint Merry. I'm no historian, but I would guess that it's probably considered the "red-headed stepchild" of Paris churches... 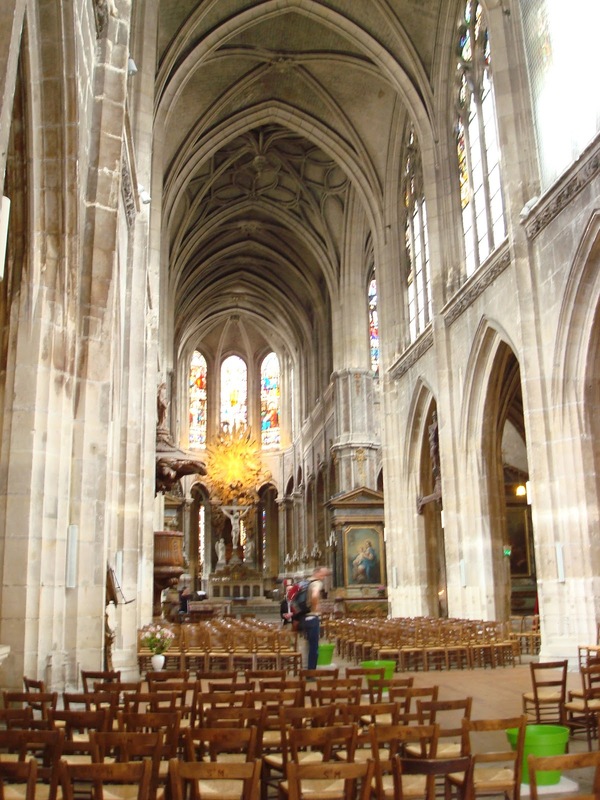 It's named after an abbot who visited (then stayed, then died) in Paris in the 8th Century. 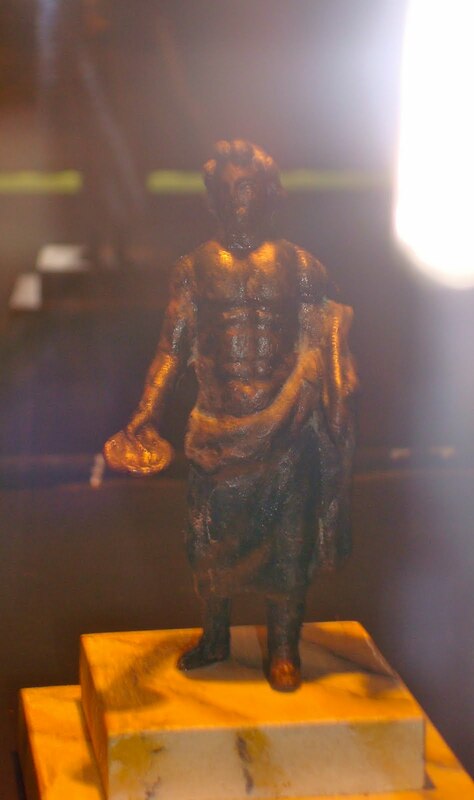 His name was Medericus -- and according to the flyer, he was also known as "Merry" and was acclaimed Patron Saint of the Right Bank. 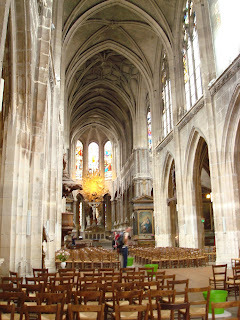 According to the guidebook, it was built in the "flamboyant Gothic" style. It's flashy, all right! But it also seems like people use it all the time. It has a lived in look, for something so fancy. Twice a week they hold music events, and there are services on Sunday. I do like their windows. So! 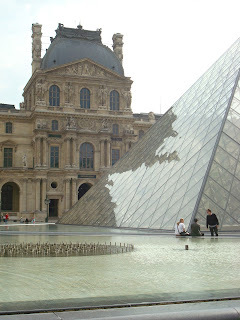 Crepes, crypts, churches, bookstores and art exhibits. And new friends made along the way. That was my pilgrimage of the day. Where should I go tomorrow?? ?